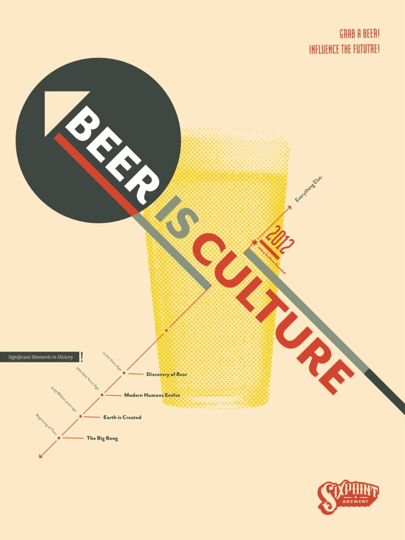 Let’s have a toast to Kevin Romero, whose original design has won this year’s Beer Is Culture contest. It was a challenging last round as our six finalists’ pieces gained more “likes” by the minute, but with a record-breaking 589 votes (and views) on the Beer Is Culture exhibition gallery on our Facebook page, Kevin’s edged out the competition. His stylized chart of beer’s progression through history is shown above, and will be the profile image for Sixpoint’s Facebook page for the rest of the year. We saw so many great works this time around in the gallery of submissions; the variety of mediums and depictions has definitely grown twofold from the previous year, too. Congratulations to all those who entered it, and we look forward to another inspiring showcase of talent next year. Indeed, like Kevin’s design exclaims, here’s to the future!